Miranda is an ordinary sixth grader, until she starts receiving mysterious messages from somebody who knows all about her, including things that have not even happened yet. Each message brings her closer to believing that only she can prevent a tragic death. Until the final note makes her think she’s too late. To ask other readers questions about When You Reach Me, please sign up. My daughter loves this book....what else might inspire her to put down the iPad and read? Legend 197 in my copy. a super short review, karenstyle!! someday, i am going to venture down to the second floor where the kids/teen section is and i am going to grab a whole bunch of books that i like and i am going to just shelve them in my adult fiction section because the young'uns shouldn't get to hog everything that is good in this world and also not have to pay rent, and there is something creepy about a 35 year old man browsing the shelves in teen fiction. * i am doing everyone a favor here. this book is great. a super short review, karenstyle!! this book is great. and sure, it won the newbery and it is intended for children but it is a sweet, sad book about friendship and family and sacrifice that most adults could really appreciate. ** i really don't want to go into too much detail - i am finding it really hard to write this review because the less you know before reading this, the better. just know that the storyline has a wonderful, unusual shape, and she does a really good job with revealing other characters through her narrator's eyes. it is always believable, as her perceptions of people change as she learns more about them - nothing is black and white - there is a great deal of nuance that feels very natural. all this and time travel, too?? in short: great, great, great. i am not giving ariel back her copy, nope. *meaning greg, who i frequently send down to fetch the teen fiction books i can't be bothered going to get myself. ** i say "most", because i can sense david looking up from his vinyl fetish book long enough to raise a questioning eyebrow at me. I know now that if I want to be completely surprised, I just have to read middle school books. Ironically, books for kids seem to have the most profound meanings. This book is sunshine and sunset combined- beautiful and heartbreaking. Coincidentally, I just read a sci-fi story about time travel before this. It was technically well explained but I don’t know why I wasn’t so impressed. This adorable little book talks about time travel too and is absolutely enthralling. It didn’t have to try so hard. It was simply and easily told but it managed to give me Goosebumps and tears at the end of the story. The characters weren’t trying to save the world here. They were just trying to save one person and it makes it even more realistic and believable. The POV is amazing! It’s one of the best elements of the story because it is told by the 12 year old Miranda through her letter in response to the notes of a mystery man- a man who seems to know things about Miranda even before they happened. The first note from the man said he’s coming to save Miranda’s friend’s life which established the mystery in the entire story. The characters are all very realistic. I love how each one played a vital role to put across the meaning of the story. I love how the book talked about life’s most ordinary things- little things in the perspective of a 12 year old girl but which made the story even more meaningful. Let me just end this by sharing some of the awesome things I learned from the book. Lots of love and thanks to my adorable friend, Pinky for recommending this adorable book to me. You can read here review here. Miranda is a sixth grader who lives in New York City. Her life seems pretty normal. She has a best friend named Sal but that all chang One of the most impressive things to me about middle grade literature is how much power their books can punch with so little pages. It still astounds me. As older people I guess we tend to over explain and over analyze. Thank goodness there are authors that can still capture the feel of being a kid growing up and how simultaneously painful and wonderful it can be. Miranda is a sixth grader who lives in New York City. Her life seems pretty normal. She has a best friend named Sal but that all changes one day. Miranda is feeling all muddled and confused, but what she does know is that she lost her best friend and can't seem to piece together why. This was not the best time to lose a friend because Miranda keeps on receiving these mystery notes. The person writing the notes seems to know what is happening before it actually does. But how can that be? And why the urgency and why her? The story's timeline (at least for me) was confusing at first. It's told through flashbacks but the reader periodically comes back to the present where Miranda's mom has been selected to be on The $20,000 Pyramid. I loved how the parent figures were an important part to the story as a whole. Miranda's mother and her boyfriend play vital roles in her life and though they might not know everything that is going on you can tell through the pages that they love her dearly. Then there is the atmosphere of the school and Miranda's classmates. I didn't grow up in 1978 or in New York but I felt the atmosphere and the tone of the relationships so well that I got caught up in Miranda's plight easily. Throughout the story Miranda is reading her favorite book, A Wrinkle in Time. This book is a kind of homage to A Wrinkle in Time. By the way if you haven't read that book yet you should, it's excellent too. What makes the story so great is the little things. Seeing Miranda help her mom prepare for the game show, the description of Sal playing basketball every day, Miranda talking about time travel with Marcus, the boys who taunt people across the street, the weird shapes on Miranda's bathroom floor, Colin hiding the bread and I could go on and on. It reflects real life right? A lot of times the little things add up to be something big and meaningful. First I have to say that A Wrinkle in Time has been my favorite or among my very favorite books since I was nine years old, and I’ve never been able to write a true or worthy review for it; I can’t even try. There are dozens, maybe hundreds, of books I wish I’d written. Occasionally, I come across a book I should have written. This is a book I definitely should have written. It touched me to the core in that incredibly familiar way that seems to come from within, not the outside. Some details are First I have to say that A Wrinkle in Time has been my favorite or among my very favorite books since I was nine years old, and I’ve never been able to write a true or worthy review for it; I can’t even try. There are dozens, maybe hundreds, of books I wish I’d written. Occasionally, I come across a book I should have written. This is a book I definitely should have written. It touched me to the core in that incredibly familiar way that seems to come from within, not the outside. Some details are “off” of course, but the gist is precisely what I would have written had I thought of it first. I inhaled this book and read it in one day, which is highly unusual for me, but used to be more typical when I was much younger. It was a joy to read. If I’d read this when I was 10, 11, 12, I suspect I’d have loved it even more. The time travel part was exquisitely done, New York too, 1979 also, the kids were completely believable, as were the adults. Memories of mine surfaced, never forgotten but powerfully brought to the present. This might not be a perfect book, but I had a near perfect experience reading it. I enjoyed trying to solve the mystery along with Miranda. I felt a deep emotional involvement, which I love feeling when I read a book. And I sure wish I had Miranda’s gift book! It also has the most lovely and meaningful dedication page I’ve seen in ages. I emailed a childhood friend, who also has always loved A Wrinkle in Time, the second I finished this book, to insist she has to read it. I do think readers who haven’t read and enjoyed Madeleine L'Engle's A Wrinkle in Time can enjoy this book, but I would suggest reading L’Engle’s book before picking up this one; it will mean so much more. This was a wonderful day, thanks to this book. Many parts are very funny. I’ve been struggling over how to begin this review. I want to get it exactly right. I want to convey to you precisely what it is that I mean to say. If you’ve read any of my reviews before then you know that I like lots of stuff. There is, quite frankly, a lot of stuff out there to like. So what I have to do here is convey to you just how this book is, pretty much, one of the best children’s books I have ever read. Here’s an idea. Have you not heard of When You Reach Me by Rebecca Stead? Well no I’ve been struggling over how to begin this review. I want to get it exactly right. I want to convey to you precisely what it is that I mean to say. If you’ve read any of my reviews before then you know that I like lots of stuff. There is, quite frankly, a lot of stuff out there to like. So what I have to do here is convey to you just how this book is, pretty much, one of the best children’s books I have ever read. Here’s an idea. Have you not heard of When You Reach Me by Rebecca Stead? Well now you have. Go read it. Have you already read When You Reach Me by Rebecca Stead? Excellent. Glad to hear it. Now go read it again. Have you already read and reread When You Reach Me by Rebecca Stead? That is fine and dandy news. Have a seat. You and I can now talk about it, and we’ll wait for the rest of the world to catch up. Which they will. Because it is one of the best children’s books I have ever read and books of this sort do not drop out of the sky every day. They don’t even drop out of the sky every year. Now the conundrum. The book is sort of a mystery. It’s sort of a lot of things and if I go too deeply into what those things are, I’m going to give away elements of the plot. This is not something I wish to do for you because the true pleasure of this book lies, at least partly, in figuring out what the heck it is. Is it realistic or fantastical? Science fiction or religious? So I just won't talk about the end, or go too far into the premise. Therein lies the problem with reviewing a book of this sort. I can’t talk about it without potentially destroying the experience for somebody out there. You can’t imagine the pressure. And I think I can summarize the plot without giving too much away, though. Here goes . . .
It’s the late 70s and the unthinkable has occurred. While walking home, Miranda’s best friend Sal is punched in the stomach for no good reason. After that, he refuses to hang out with Miranda anymore. Forced to make other friends, Miranda befriends the class yukster and a girl who has also recently broken up with her best friend too. But strange things are afoot in the midst of all this. Miranda has started receiving tiny notes with mysterious messages. They say things like “I am coming to save your friend’s life and my own” and “You will want proof. 3 p.m. today: Colin’s knapsack.” Miranda doesn’t know who is writing these things or where they are coming from but it is infinitely clear that the notes know things that no one could know. Small personal things that seem to know what she's thinking. Now Miranda’s helping her mom study for the $20,000 Pyramid show all the while being driven closer and closer to the moment when it all comes together. When you eliminate the possible all that remains, no matter how extraordinary, is the impossible. You know how sometimes in literature or writing classes a teacher will assign a first page of a novel as an example of a “good” first page? The kind that grips the reader by the throat and gives ‘em a good hard shake? Yeah. This book has that first page. You are gripped from the start. Then the plot begins its slow backing and forthing in time. We’re in April of 1979 . . . and then we’re in August or September of the previous year. The jump back and forth isn’t jarring, it just requires that the brain be a little more awake during the reading. In fact, there are a lot of moments in this book that would come off as confusing or impossible to understand were it not for the fact that Stead is keeping a close and steady eye on the whole proceedings. What could be a muddle or a mess is instead a gripping mystery with moments of touching realizations and truths cropping up left and right. Another sign of a good book: the whole show-don’t-tell rule of storytelling comes into play time and time again. Miranda casually mentions facts about the people around her that define them and bring them into sharp focus. The fact that she was named after the Miranda’s Rights or that her mom won’t let her eat grapes because of how the grape pickers are treated in California. The same can be said for Miranda herself. She’s defined best by sentences like, “ ‘Nice tights,’ I snorted. Or I tried to snort, anyway. I’m not exactly sure how, though people in books are always doing it.” The book is an amazing mix of humor and depth. On the funny side are mentions of things like the SSO’s, which stand for the strawberries at the corner sore that fail to fulfill their promise and thus are deemed “strawberry shaped objects”. On the other hand, the implications at the end of this book can be sad. Sad and interesting and fascinating all at the same time. Kids may find themselves contemplating free will by the story’s end. There are worse fates in this world. The crazy thing is that it’s also the kind of book that kids will really really like AND the kind that award-giving librarians will really really like. We aren’t usually so lucky. There’s a kind of broccoli and peas mentality to great works of children’s literature sometimes. This idea that if something is well-written that it can’t possibly be interesting as well. And even crazier than that is the fact that this isn’t going to appeal to just one kind of kid. It’s going to be adored by both boys and girls. By kids who are into science fiction and kids that refuse to touch anything but truly realistic stories. Heck, you could even label this book historical fiction since it takes place in 1978-79. And not the fake 1979 that you sometimes seek invoked in bad television shows and movies either. This is an accurate portrayal of a time period when a person really could spend their days helping their mom prepare for a stint on the $20,000 Pyramid. A time when a girl could be handed books with pictures of spunky-looking girls on the covers... and subsequently reject them because they are not A Wrinkle in Time. Stead also foreshadows subtly, which is a near impossible thing to do. I’ve been reading a lot of children’s books lately where you’ll get near the end of the chapter and there will be this big sentence in black and white reading, “Years later she would look back on that moment and wonder what would have happened if she only hadn’t blah blah blah.” Or “It would haunt her dreams for years afterwards.” Or “Had she known then what she . . . “, you get the picture. Stead does allude to the future, but subtly. There’s a moment when Miranda mentions that she hadn’t been in a particular store since December, then flashes back to November or so. If you’re paying attention, you’re left wondering what’s going to happen, but not in a way that intrudes on your reading experience. It’s a subtle move on Stead’s part. Foreshadowing with stealth. I’ve been calling it LOST the book, referencing the television show that leaves you with as many questions as this novel initially does. But unlike LOST, the answers are forthcoming. And the crazy thing is, it all fits together. Every little piece of the puzzle. You end up rereading the whole thing just to watch the puzzle pieces fall into place before your eyes. The kind of rereading that Miranda does to A Wrinkle in Time. I have a theory about that book, by the way. I believe that author Rebecca Stead may have read and reread that book just like Miranda does when she was a kid herself. I mean, who else is going to spot the time travel flaw in that book? How many times would a person have to read it before they caught on to what was going on? In the end, there’s a darkness to When You Reach Me. A darkness and a depth that pulls you in, but somehow doesn’t depress you. I guess some kids will get depressed. The kids that only read light, happy stories where everything turns out sunshine and roses, sure. But for the reader that really gets into it, When You Reach Me is fun, challenging, and able to reach a whole swath of different kinds of readers. Without a doubt, it’s one of the most fascinating children’s novels I’ve ever read. You won’t find anything else quite like it on the market today. Beautiful, just beautiful! I loved this book so much! The writing style was marvelous, I loved the main character. So many people told me to read this book and I finally did. The plot was different and unique. This is how I found out about this book. I was sitting at my desk in Tec class and I was reading the last book in the Mistborn Trilogy. When I was at the most intense scene, someone poked me on the shoulder. "WOAH," I screamed. I was terrified, but I should have known it was Beautiful, just beautiful! I loved this book so much! The writing style was marvelous, I loved the main character. So many people told me to read this book and I finally did. The plot was different and unique. This is how I found out about this book. "WOAH," I screamed. I was terrified, but I should have known it was my close friend, Thanu. "Sorry, I didn't mean to scare you. You're so into the book, you don't even notice what is happening right in front of you,"she said. "I know, it's just SO INTERESTING!" I said. "I have this thing I want to show you..." she said with a huge smile on her face. "What is it, you seem really excited." I said. Thanu grabs her backpack and pulls out a book. She clasped the book and showed me the cover, her smile brightened. "When You Reach Me... Show me the summary, it looks so different. The book is so tiny!!" I said and I grab for the book. But before I could reach it, my friend moved away. Thanu was hugging the book against herself and she looked like she was in the middle of a dream. "The book is so good man! You won't understand until you read it. You better read it and finish it by tonight. It has time-travel and everything! So magical, so beautiful." she exclaimed! So I attempted to grab the book again, but she moved away. Her grip tightened on the book and I stared at the book. "No man, it's just really good, I loved it so much. I stayed up reading it and I finished at 12:00 PM. My mom started yelling at me but the book was so good so it was worth it. The main character is kinda like you. I don't know, I can't wait for you to read it." she was talking super fast. "Okay. But you have to give me the book first, I want to read the summary and see what the hype is about." I said. Thanu sighs and passes the book over, and I grab it before she could change her mind. When I was reading the summary, I understood why the book was so good. I had to read it as soon as I could. "Soo, Whatdya you think?" she asked. "It sounds really good! I'll read it as soon as I ca-" I said before I was interrupted. "TONIGHT!" she screams. "When you are finished the book, call me." The book follows a girl named Miranda who is best friends with a boy named Sal. One day, when Sal and Miranda were walking together, Sal gets punched by another boy. Ever since that day, Sal avoided Miranda, and they haven't hung out. Later on, someone found Miranda's spare key to her apartment. But instead of stealing something, the person sent Miranda a note. The person who was writing the notes knew Miranda's name and mentioned something about saving one from a tragic death. But in order for Miranda to do that, she had to write a note in reply to the person's note. When I was about to read the book, I kept thinking that I knew what was going to happen in the end. But all my predictions were wrong. I was so shocked and when I finished the book I had to sit down and think. It was just so unusual and I was so amazed. I called my friend and we talked about the book and now I understand why she loved the book. The plot was complex and different from the usual stories I read. I know you might think I say that to every book but there are so many books out there that are different. While other books are so similar to each other. It was fast-paced and I didn't want to put the book down. I wanted to know the ending of the story so I kept reading. Now I understand my friend and why she was so excited for me to read this book. Although I loved the characters, the main point of the story was the plot. I like the characters but I am not attached to them. I laughed at some of the things that the characters said. I don't know why my friend said the main character was kinda like me. I felt like we were so different from each other. But I liked her anyway. I feel like I'm missing something because every other review seems to be five stars. I liked the book. How could I not, when it references A Wrinkle in Time so often. I personally found the mystery to be easily solved. I like how the author weaved the clues in, but I found it to be very obvious and knew from the beginning from the book who it was and how it would work. I'm not sure if kids will feel the same way. But the ease with which I solved the mystery is why I don't think I can give this book as glowing a review as everyone else seems to. I almost did not read this book. I knew it was targeted for a younger audience, but I didn’t realize just how young. I kept vainly searching for it in the teenagers’ section (where I was already a bit embarrassed to be spotted). When I realized I would have to go inside the children’s section at B&N, I wavered. The little chairs. The colored foam titles on the floor. The stuffed animals. It’s all cute, but could one of those books satisfy me? It probably deserves more than three stars. But it I almost did not read this book. I knew it was targeted for a younger audience, but I didn’t realize just how young. I kept vainly searching for it in the teenagers’ section (where I was already a bit embarrassed to be spotted). When I realized I would have to go inside the children’s section at B&N, I wavered. The little chairs. The colored foam titles on the floor. The stuffed animals. It’s all cute, but could one of those books satisfy me? It probably deserves more than three stars. But it is hard for me to judge at twenty five years old. I am not an elementary school teacher, a children’s librarian, or a mother. My days of baby-sitting for $6 an hour are long gone. I don’t know how kids would react. At eight, I might have given it five stars and then complained to my mom that the rating system needed to be changed because this book deserved at least sixteen stars. As an adult, I am not jumping up and down, but I enjoyed it. It is charming. The solution to the puzzle was satisfying and only modestly predictable. And I was surprised to glimpse some deeper and gritty topics: rehabilitation in prisons, homeless people, racism, single mothers, dead-end jobs. I didn’t expect to encounter these in a children’s book and they were artfully applied. Indeed, during the event, Rebecca spoke about how she didn’t think kids needed to be so protected. Rebecca also spoke about the inspiration for the book. You’d think A Wrinkle in Time was the starting point. Wrong! The idea began as she read a New York Times article about a guy walking around Denver, Colorado with amnesia. When he asked for help, everyone avoided the “crazy” man. After reaching a hospital and being put under hypnosis, he remembered exactly two things about himself: (1) he was married to Penny and (2) they had two daughters who had both died in a car accident. When they finally identified this man, he had a fiancé named Penny and no children. Creepy! This is a book that kept coming up over the years in different book podcasts that I listened to. I finally got to it as I was looking for a shorter audiobook to finish before I leave for vacation. This fit the bill perfectly. For some reason, I didn't realize it was a middle grade book, but certainly left nothing out for me. Miranda is your average 12 year old girl trying to find her way in NYC. Her mom is auditioning and practicing for the Pyramid game show (which was the i This book was so good! I was a sixth grader in 1979. In seventh grade, I wrote a book report on A Wrinkle In Time, which remains on my favorite books-of-all-time list to this day. I have not read L'Engle's classic in a long time. The books we love from childhood are as much about who we were when we read them as it is about the books themselves. I suppose I fear that I won't enjoy A Wrinkle In Time as much as I did when I was twelve. Rebecca Stead's When You Reach Me might change my mind. The book takes place in 1979, a I was a sixth grader in 1979. In seventh grade, I wrote a book report on A Wrinkle In Time, which remains on my favorite books-of-all-time list to this day. I have not read L'Engle's classic in a long time. The books we love from childhood are as much about who we were when we read them as it is about the books themselves. I suppose I fear that I won't enjoy A Wrinkle In Time as much as I did when I was twelve. The book takes place in 1979, and the protagonist, Miranda, is a sixth grader, just like I was. Her favorite book, is... (can you guess?). A homeless man takes up residence outside Miranda's apartment building. Another boy punches Sal in the stomach for no reason. Miranda receives a cryptic note tucked inside a library book. And yes, A Wrinkle In Time plays a key role in the story. The blogosphere overflows with reviews praising this book. Don't read anymore of them, go to the bookstore, instead! Ms. Stead mentions in her goodreads profile that she loves to give every book she reads five stars. When You Reach Me deserves more. $1.99 Kindle special, March 2, 2018, for this 2010 Newbery award winner. And karen gave it 5 stars! so I'm off to buy it now. I love middle-grade books. The quality is usually as good as with adult books, yet they are so cute, fresh and easy-to-read. They also attack problems in life head on. They are rarely politically-correct. Kids don't beat around the bush and neither do the books for them. At times that first part is in I love middle-grade books. The quality is usually as good as with adult books, yet they are so cute, fresh and easy-to-read. They also attack problems in life head on. They are rarely politically-correct. Kids don't beat around the bush and neither do the books for them. At times that first part is interesting, at times slow (as life can sometimes be :-), but always well written. Then things heat up big time when the mystery kicks in. It's not hard to guess how the letters are sent, but by whom, why...? I guessed who the sender is after the second letter and who the sender was after the third, but wasn't sure. The book kept me on my toes. And I didn't get the why until much later. The story then just gets better and better, and more personal. And the end is amazing. One of the best endings--easily 5+ stars. My eyes got teary when Miranda gave birthday presents to her mom and the mom's bf. And when she thought of the implications her letter would have on the mystery person. I highly recommend this book to everyone. P.S. My son loved it, too. Soak that title in. Have you ever heard anything so unique and beautiful? The inside of the book is even more so. I knew it right away from the very originally named chapter titles and the use of second person perspective. (Hats off to the author--no one ever does that!) I knew even more with the odd clues and the references to A Wrinkle in Time. There were sweet moments to the story--working at a restaurant with friends, baking a ridi Soak that title in. Have you ever heard anything so unique and beautiful? The inside of the book is even more so. I knew it right away from the very originally named chapter titles and the use of second person perspective. (Hats off to the author--no one ever does that!) I knew even more with the odd clues and the references to A Wrinkle in Time. There were sweet moments to the story--working at a restaurant with friends, baking a ridiculously awful but fun cake, and Miranda’s interactions with her mom. (It was also heartwarming to see how she and Richard were totally in cahoots.) I loved how, through the events that happened, Miranda learned to love those around her in small but tangible ways (prime example: Alice). It was especially neat to see how her opinion of certain characters changed as she looked at them in a more nuanced way (prime example: also Alice). Actually, I surprised myself by thoroughly enjoying this book. This is why: 1) I rarely like any books whose target audience is middle-schoolers; 2) "When You Reach Me" is a sort of homage to Madeleine L'Engle's "A Wrinkle In Time," a novel which I couldn't get myself to finish. It's a little hard to give a synopsis of the story. 12-year old Miranda's best friend Sal suddenly stops talking to her. The apartment key that Miranda’s mom keeps hidden for emergencies is stolen. And then Miranda start Actually, I surprised myself by thoroughly enjoying this book. 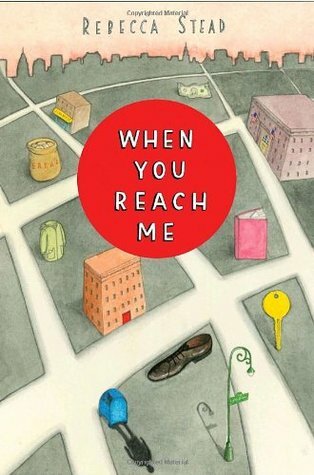 This is why: 1) I rarely like any books whose target audience is middle-schoolers; 2) "When You Reach Me" is a sort of homage to Madeleine L'Engle's "A Wrinkle In Time," a novel which I couldn't get myself to finish. This intriguing modern day story draws inspiration from Madeleine L'Engle's A Wrinkle in Time. When Miranda's mother unexpectedly fell pregnant during college, she put her studies on hold and took time out to care for her baby. Twelve years later mother and daughter are poor but happy together. Miranda is a good girl, but like many her age her world is small and revolves mainly around herself. When strange notes appear which tell her about things that will happen in the future, she is intrigued. Miranda is a good girl, but like many her age her world is small and revolves mainly around herself. When strange notes appear which tell her about things that will happen in the future, she is intrigued. As she tries to solve the mystery she is gradually drawn out of herself, and for the first time she understands the needs of those around her. This book is a little like Spinelli's Stargirl. It helps you to value living in the present moment, gradually removing the veil of selfishness that prevents you from seeing the world and the people around you. It is a puzzle that gradually pieces together, only truly coming clear on the last page. It's brilliantly structured and crafted in clear prose, and when you reach the end you realise that every detail was important... so you read it all again. I'd recommend this for relatively mature readers who can handle a mystery that may at times appear worse than it is, they can be assured that the resolution is as inspiring as it is surprising. It's a time travelling story. It will remind you of other time travelling stories. But that's just the box. What's inside is bona fide gold. Newbery medal and all...so I guess I should have seen that coming, but I didn't. It was a delightful surprise. Miranda is twelve and lives in NYC with her mom. Her mom has rules about city living like never show your money on the street and always have your key out before you reach the front door. But Miranda has a trick of her own. "If I'm afraid of someon It's a time travelling story. It will remind you of other time travelling stories. But that's just the box. What's inside is bona fide gold. Newbery medal and all...so I guess I should have seen that coming, but I didn't. It was a delightful surprise. Miranda is twelve and lives in NYC with her mom. Her mom has rules about city living like never show your money on the street and always have your key out before you reach the front door. But Miranda has a trick of her own. "If I'm afraid of someone on the street, I'll turn to him (it's always a boy) and say, 'Excuse me, do you happen to know what time it is?' This is my way of saying to the person, 'I see you as a friend, and there is no need to hurt me or take my stuff. Also, I don't even have a watch and I am probably not worth mugging.' So far it's worked like gangbusters, as Richard would say. And I've discovered that most people I'm afraid of are actually very friendly." Another thing she discovers: "Sometimes you never feel meaner than the moment you stop being mean"
I hope my daughter wants to read it. If she enjoys it even half as much as I did, I'll be thrilled to pieces. A blog post about reading it aloud to my fourth graders with links to their own blog posts. In a conventional novel for young people, Miranda Sinclair’s mother practicing to be a contestant on The $20,000 Pyramid would be the highlight — nay, the entirety — of the novel. But by now you’ve guessed that When You Reach Me is no ordinary novel; instead, it’s one of the most unconventional novels I’ve ever read — and I’m including The Name of the Rose, The Icarus Hunt, Dorp Dead, and Miranda’s favorite book of all time, A Wrinkle in Time. Miranda’s mother, a bleeding-heart paralegal and sin In a conventional novel for young people, Miranda Sinclair’s mother practicing to be a contestant on The $20,000 Pyramid would be the highlight — nay, the entirety — of the novel. But by now you’ve guessed that When You Reach Me is no ordinary novel; instead, it’s one of the most unconventional novels I’ve ever read — and I’m including The Name of the Rose, The Icarus Hunt, Dorp Dead, and Miranda’s favorite book of all time, A Wrinkle in Time. Miranda’s mother, a bleeding-heart paralegal and single mom, does achieve her dream of garnering a spot on the ABC game show, but that fact is dwarfed by the main point of the novel, which doesn’t reveal itself until two-thirds of the way through. When You Reach Me is best enjoyed when the reader goes in without knowing much. But I can reveal that the novel dwells on how a small act can profoundly affect those around you, for good or ill. That what has become a platitude can be expressed so profoundly and uniquely is a testament to author Rebecca Stead’s talent. Miranda and her friends Sal, Annemarie, Colin, Marcus Heilbronner, and Julia — whether in their pettiness or superciliousness or self-absorbed cruelty or bad-boy misunderstood pose — will strike the reader as real kids, with all the rough edges and inexplicable kindnesses and cruelties that that implies. Whether you’re an adult or child, this will be one of the more original works you’ll ever read. 2.5 stars. Going right in between "okay" and "I liked it" on this one. On the good side, this is a clever YA (emphasis on the young) mystery that is fairly well paced and a good ending. I also thought the discussions about time were pretty good and may interest younger readers in wanting to learn more. On the negative side, I didn't really like the characters and the prose, while good, was not as engaging as I would have liked. That could very well be simply the result of its aiming for a younge 2.5 stars. Going right in between "okay" and "I liked it" on this one. On the good side, this is a clever YA (emphasis on the young) mystery that is fairly well paced and a good ending. I also thought the discussions about time were pretty good and may interest younger readers in wanting to learn more. On the negative side, I didn't really like the characters and the prose, while good, was not as engaging as I would have liked. That could very well be simply the result of its aiming for a younger target audience. However, for me, it kept me from rating it higher. While I label this great book (to be published in July 2009) science fiction, that element is not the most obvious part of the story. Rather it's the story of Miranda, who doesn't understand why her best friend from the floor below her has cut her off since the day a big kid punched him in the stomach. We follow her through school as she tries to make friends with the well-to-do Annamarie and Colin, tries to sort out Julia's emnity, and together with her mother's boyfriend helps her mother to pr While I label this great book (to be published in July 2009) science fiction, that element is not the most obvious part of the story. Rather it's the story of Miranda, who doesn't understand why her best friend from the floor below her has cut her off since the day a big kid punched him in the stomach. We follow her through school as she tries to make friends with the well-to-do Annamarie and Colin, tries to sort out Julia's emnity, and together with her mother's boyfriend helps her mother to prepare for a TV game show with a big money prize. With all this going on, there is one more mystery: the tiny notes that show up, giving Miranda strange hints about the future. WOW. Holy cow. I did not see this coming. This was fantastic. This is going straight to my best of all time list. Very original, awesome setting. A very smart book. Great writing. LOVED it. Can't wait to read it again. Read it again. Just as good the second time. 7/29/2014: My fourth read! Always amazing, but this time was really cool. My niece is at my house for a few days. She has to read this over the summer for school! We stayed up all night reading it right to the end. We both loved it. My vo WOW. Holy cow. I did not see this coming. This was fantastic. This is going straight to my best of all time list. Very original, awesome setting. A very smart book. Great writing. LOVED it. Can't wait to read it again. When You Reach Me is a middle grades science fiction novel set in the late 20th century in the Upper West Side of New York City. The novel is a bit of a mystery, as well, as it focuses on the identity of the mysterious letter writer contacting sixth-grader Miranda. There are other elements woven in, additionally, including A Wrinkle in Time, some time travel, and Jewish culture. As a whole, this book had much to discuss (in a classroom) as far as plot, characters, and setting, despite being a qui When You Reach Me is a middle grades science fiction novel set in the late 20th century in the Upper West Side of New York City. The novel is a bit of a mystery, as well, as it focuses on the identity of the mysterious letter writer contacting sixth-grader Miranda. There are other elements woven in, additionally, including A Wrinkle in Time, some time travel, and Jewish culture. This was such a good book! I've learned to be wary of Newberry winners because, for some reason, they tend to be awful, but this one was so wonderful! It was well-written, touched on a lot of sticky issues in a really open, but tactful way, and the first person narration felt very authentic. The "twist" was fairly obvious to an adult, but I have no doubt that lots of kids' jaws dropped. I will definitely be recommending this book to all the middle schoolers I know. This is the newest Newbery Medal Award Winner and I had actually wanted to read it before it had been nominated. This is a cleverly written "slice of life" tale that transcends age, gender, and race and is a great story that anyone and everyone can enjoy. This book twists and turns and meanders about in such a fascinating way that you're quickly pulled into Miranda's and her friends' lives and what it's like to grow up in New York in the late '70s. Some of the observations that the auth 4.5 stars! This book twists and turns and meanders about in such a fascinating way that you're quickly pulled into Miranda's and her friends' lives and what it's like to grow up in New York in the late '70s. Some of the observations that the author made were so random yet nostalgic for me that I felt transported back to elementary school. I connected with the characters in a way that doesn't happen all that often with children's books for me anymore, and I'm not sure if that's because I'm getting older or if I'm just not reading that many great children's books anymore. This sort of reminded me of how I felt when I read Roald Dahl; he didn't dumb things down for kids and he knew how to write a great story. The only reason I didn't give this 5 stars was because of the main conclusion at the end. I think I wanted something a little more realistic and I was hoping the author was going to tie things up in a different way than I saw playing out. Don't get me wrong though, the end didn't spoil the book for me, I just felt like things could have gone differently. I just finished this, and I'm feeling like I missed something. So many people are raving about this, but I don't see it. I liked the New York setting, the kids running around on their own with latch keys, and the visits to the sub shop at lunch time. The friendships and characters were good, but didn't seem remarkable. The story is about Miranda, who lives with her mom in New York, and whose favorite book is A Wrinkle in Time, which is one of my favorite books, too. Her mom wants to get on the $ I just finished this, and I'm feeling like I missed something. So many people are raving about this, but I don't see it. I liked the New York setting, the kids running around on their own with latch keys, and the visits to the sub shop at lunch time. The friendships and characters were good, but didn't seem remarkable. The story is about Miranda, who lives with her mom in New York, and whose favorite book is A Wrinkle in Time, which is one of my favorite books, too. Her mom wants to get on the $50,000 Pyramid game show, and manages to get picked as a contestant. Miranda and her mom's boyfriend help her practice. Miranda's friendship with downstairs neighbor Sal is suffering, and she's not sure why. And someone is leaving her weird little notes that have her freaking out. And this kid, Marcus, who punched Sal for no reason one time, suddenly is talking to her. I'm thinking I missed something, that I'd benefit from a re-reading. Why do I think that? Because, I'm wondering about alternate timelines, which isn't good, is it? Shouldn't I be thinking about friendship, and sacrifice, and stuff? Tiny, tremendous book! True story – I was reading this morning in the waiting room at the doctor's office. I'd spent the whole train ride up bitching to myself about how these guys are always overscheduled and without fail they're running at least half an hour behind. So I'm sitting there, about 90% of the way through my audiobook, and my name gets called. And I'm all, ". . . you're early," and the tech is all, "it's weird, isn't it?" and honest to God I was thisclose to telling him to come back Tiny, tremendous book! True story – I was reading this morning in the waiting room at the doctor's office. I'd spent the whole train ride up bitching to myself about how these guys are always overscheduled and without fail they're running at least half an hour behind. So I'm sitting there, about 90% of the way through my audiobook, and my name gets called. And I'm all, ". . . you're early," and the tech is all, "it's weird, isn't it?" and honest to God I was thisclose to telling him to come back in half an hour so I could finish this book. New York, 1979. Twelve-year-old Miranda starts getting notes that say things like, "I'm coming to save your friend's life." This is a bitty little book, but every second of it works. Miranda is a perfect twelve-year-old, and this book does a whole lot of sixth-grader relationship work in a very small space. And behind that and the wonderful cast of characters is another story, a creepier, scarier, sadder one. It didn't matter that I'd figured out most of it, because I still got chills when things started snapping together. A book about A Wrinkle in Time, and growing up, and moments of time like diamonds, crystallized forever. Just tremendous. This book was really good! I'm giving this book 8. 5 stars because it was so amazing. In love how everything was tied together all into one outcome. I will write a better review later on because I'm on a bus right now!